You know what is a little thing? Saying the word “Yes” or “Sure” when someone offers to help. It is such a little thing to allow someone the gift of doing something for you. 2 Corinthians 9:7 tells us clearly that God loves a cheerful giver. Don’t give under compulsion, Paul tells us, but give what you determine to give. And give it cheerfully. That entire passage is specifically speaking of money. Cash. Dollars. So it cannot be confused that we are to give money cheerfully. Seeing people do amazing things encourages and inspires me. Hearing a testimony about someone conquering their fear or disability or insecurity and finish something awesome lights a fire in me. Meeting someone who is simply “doing it” absolutely challenges me. Do you know anyone like that? Have they spurred you on? Be a GREAT meal gifter! What is meal gifting? You know, gifting a meal to someone who is in need of one. 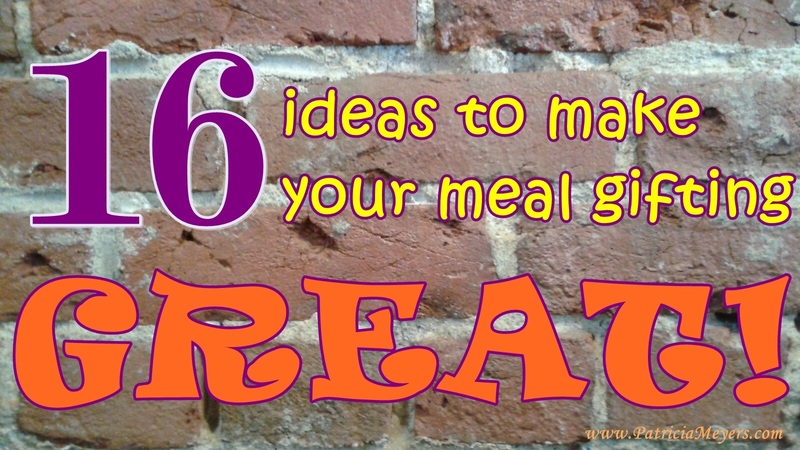 There are so many people that have helpful hints about bringing meals to those in need. Why do I want to do one more? Because it is a BIG deal! When someone falls ill, or has a baby, or loses a loved one, or is caring for a loved one with an extended illness, or is placed on bed rest; there are so many areas of need. One blessing that can eliminate a large headache is having meals brought in for a while. It cannot bring back a loved one, make cancer go away, or cause bed rest to be a pleasure. But it does help. It really does.